중장기물 금리가 비교적 큰 폭(2bp-4bp)으로 하락하여 만기 6개월의 단기 재무성증권 (T-Bill) 보다 중장기 재무성증권(T-Bond) 금리가 더 낮은 「수익률 역전(inverted) 상태」가 더욱 심화되었음. 이는 최근 미국 Fed의 금리인상에 대한 우려가 약화되면서 중장기 T-Bill에 대한 수요가 크게 늘어난 때문. 다음 주에 수익률역전이 더 심화될 지는 아직 불확실. 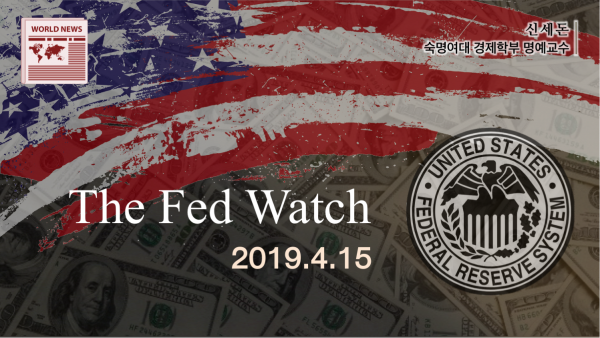 ■ FED 이사회 (현재 5명)와 FOMC(총 10명, 5명 중복)는 워싱톤DC에서 2019년 3월 19일과 20일 연석회의를 개최하였고 그 세부내용(Minutes)를 4월 10일 오후 2시 공개하였음. T-Bill 보유축소계획을 축소(늦춤)하는 것은 Fed이 늘 말해온 “신축적 정책”의 원칙에 부합됨. 적정 본원통화량으로 돌아갈 수 있다는 장점이 있음. 참석자들은 충분한 유동성 공급정책의 원칙을 유지하고 또한 Fed 정책의 불확실성을 제거한다는 차원에서 계획된 정부채권 단계적 규모축소를 9월까지 끝내기로 결정함. 참석자들은 FOMC가 채택하고 있는 장기적정수준까지 보유채를 줄이는 정책에 동의함. 아래 [참고1]은 대차대조표 정상화계획(Balance Sheet Normalization)에 대한 원칙과 계획임. 오버나이트 리버스 RP를 포함하는 모든 필요한 조치를 강구하기를 Desk에 지시함. Effective March 21, 2019, the Federal Open Market Committee directs the Desk to undertake open market operations as necessary to maintain the federal funds rate in a target range of 2¼ to 2½ percent, including overnight reverse repurchase operations (and reverse repurchase operations with maturities of more than one day when necessary to accommodate weekend, holiday, or similar trading conventions) at an offering rate of 2.25 percent, in amounts limited only by the value of Treasury securities held outright in the System Open Market Account that are available for such operations and by a per-counterparty limit of $30bn/per day. The Committee directs the Desk to continue rolling over at auction the amount of principal payments from the Federal Reserve’s holdings of Treasury securities maturing during each calendar month that exceeds $30 billion, and to continue reinvesting in agency mortgagebacked securities the amount of principal payments from the Federal Reserve’s holdings of agency debt and agency mortgage-backed securities received during each calendar month that exceeds $20 billion. Small deviations from these amounts for operational reasons are acceptable. 제롬 H. 파월이 2018년 2월 5일 연방준비제도이사회(Board of Governors of the Federal Reserve System)의 16대 의장으로 취임하였다. 트럼프 대통령이 의장으로 임명한 그는 1987년 앨런 그린스팬 이후 최초로 경제학박사 학위가 없는 연준 의장이 되었다. 제롬 파월은 오바마 대통령에 의해 미시킨의 후임으로 연방준비제도이사회 이사로 2012년 5월 25일 취임했었다. 미시킨의 잔여 임기가 2013년 말까지였으므로 2014년 1월 다시 재임명됨으로써 14년의 임기를 새로 시작했다. 그는 1953년 워싱턴 DC에서 변호사인 아버지 제롬 파월과 어머니 패트리셔 헤이든의 6남매 자녀로 태어났다. 프린스턴 대학에서 정치학을 전공하여 졸업하고(1975년) 외할아버지 헤이든 교수가 재직하고 있던 조지타운 대학 법대에 입학하여 1979년 졸업했다. 졸업 후 Davis Polk & Wardwell라는 로펌에서 1981년부터 1984년까지 근무하고 1984년에는 Dillon, Read & Co라는 투자은행으로 옮겨 1990년 까지 일했다. 이 기간 중에 엘리싸 레너드와 결혼했다(1985년). 슬하에 3 자녀가 있다. 재산은 1억 천만 달러가 넘는 것으로 알려져 있다. 딜론 투자은행회장 브래디가 아버지 부시 행정부에서 재무장관이 되면서 그를 따라 1990년 미국 재무부로 들어갔으며 1992년부터 1993년까지 국내금융담당 재무부차관을 역임했다. 1993년 재무부를 나와 뱅커스 트러스트 은행의 사장(MANAGING DIRECTOR)이 되었다가 1995년 다시 딜론 리드 투자은행으로 돌아갔다. 1997년부터 2005년 까지 사모펀드 카알라일 그룹의 파트너가 되었고 사설 투자펀드인 Sevem Capitals Group를 설립하기도 했다. 2008년에는 사설 벤처투자기업인 Global Environment Fund의 파트너 겸 사장이 되었다. 2010년과 2012년 사이에는 Bipartisan Policy Center라는 연구기관에 연봉 $1로 방문학자로 일했으며 2011년 12월에 오바마 대통령에 의해 Jeremy C. Stein과 함께 연준 이사로 임명 제청되었다. 공화당원인 파월이 다른 당인 민주당 대통령에 의해 임명제청된 것은 1988년 이후 처음 있는 일이었다. 오바마가 다른 당원을 임명제청한 것은 같은 당원인 스타인의상원인준을 운활하게 하기 위한 일종의 맞바꾸기 딜이었다. 2012년 5월 25일 사임한 Frederic Mishkin 교수의 잔여임기(2014년 1월 말까지)를 채운 뒤 2014년 다시 재임명제청이 되어 14년 임기를 새로 시작했다. 2014년 6월에 인준 투표에 들어간 미국 상원은 찬성 67대 반대 24로 가결하였다. 그의 임기는 2028년 1월 말에 끝난다. 트럼프 대통령에 의해 연준 의장으로 임명 제청된 파월은 2017년 12월 5일 상원금융위원회에서 찬성 22대 반대 1로 가결되었으며 본회의 인준투표에서는 찬성 84대 반대 13으로 가결되어 2018년 2월 5일 재닛 옐런의 후임으로 연준 의장에 부임하였다. 2017년 3월에 있었던 경제전문가 30인의 서베이에 따르면 파월은 다소 온건한 비둘기파로 분류되었으나 블룸버그 분류에 따르면 중립적인 것으로 평가되고 있다. 실제로 2012년 실시된 양적완화3(QE3)에 대해 회의적인 견해를 피력한 적이 있다. 금융위기 직후에 나온 개혁적인 법안(도드 프랭크 금융개혁법안:The Dodd–Frank Wall Street Reform and Consumer Protection Act)에 우호적인 태도를 보여 왔으며 특히 더으ᅟᅮᆨ 높은 자본 및 유동성 규제와 스트레스 테스트는 금융안정에 기여하고 있으므로 지속되어야 한다는 견해를 피력한 적이 있다. 또한 볼커룰에 대해서는 소규모 은행들을 제외시키는 쪽으로 수정되어야 한다고 피력하였다. 주택금융개혁에 관해서는 연준이 떠안고 있는 주택금융기관(Fannie Mae and Freddie Mac)을 그대로 두어서는 안 된다고 강조하였으며 비록 그대로 두는 것이 편할지 몰라도 지속될 수는 없을 것이라고 강조하면서 조속한 개혁조치를 촉구하였다. 특히 행정부가 부동산 시장 실패에 책임이 있으므로 민간부문의 충분한 유동성 공급을 통하여 부실한 부동산 증권의 자연스런 인수를 강조하였다. ∎ To ensure a smooth transition to the longer-run level of reserves consistent with efficient and effective policy implementation, the Committee intends to slow the pace of the decline in reserves over coming quarters provided that the economy and money market conditions evolve about as expected. o The Committee intends to slow the reduction of its holdings of Treasury securities by reducing the cap on monthly redemptions from the current level of $30 billion to $15 billion beginning in May 2019.
o The Committee intends to conclude the reduction of its aggregate securities holdings in the System Open Market Account (SOMA) at the end of September 2019.
o The Committee intends to continue to allow its holdings of agency debt and agency mortgagebacked securities (MBS) to decline, consistent with the aim of holding primarily Treasury securities in the longer run. △ Beginning in October 2019, principal payments received from agency debt and agency MBS will be reinvested in Treasury securities subject to a maximum amount of $20 billion per month; any principal payments in excess of that maximum will continue to be reinvested in agency MBS. △ Principal payments from agency debt and agency MBS below the $20 billion maximum will initially be invested in Treasury securities across a range of maturities to roughly match the maturity composition of Treasury securities outstanding; the Committee will revisit this reinvestment plan in connection with its deliberations regarding the longer-run composition of the SOMA portfolio. △ It continues to be the Committee’s view that limited sales of agency MBS might be warranted in the longer run to reduce or eliminate residual holdings. The timing and pace of any sales would be communicated to the public well in advance. o The average level of reserves after the FOMC has concluded the reduction of its aggregate securities holdings at the end of September will likely still be somewhat above the level of reserves necessary to efficiently and effectively implement monetary policy. In that case, the Committee currently anticipates that it will likely hold the size of the SOMA portfolio roughly constant for a time. During such a period, persistent gradual increases in currency and other nonreserve liabilities would be accompanied by corresponding gradual declines in reserve balances to a level consistent with efficient and effective implementation of monetary policy. Federal Reserve’s non-reserve liabilities and maintain an appropriate level of reserves in the system. Committee participants resumed their discussion from the January 2019 meeting on options for transitioning to the longer-run size of the balance sheet. The staff described options for ending the reduction in the Federal Reserve’s securities holdings at the end of September 2019 and for potentially reducing the pace of redemptions of Treasury securities before that date. Reducing the pace of redemptions before ending them would be consistent with most previous changes in the Federal Reserve’s balance sheet policy and would support a gradual transition to the long-run level of reserves. It could also reinforce the Committee’s communications indicating that the FOMC was flexible in its plans for balance sheet normalization and that the process of balance sheet normalization would remain consistent with the attainment of the Federal Reserve’s monetary policy objectives. However, continuing redemptions at the current pace through September might be simpler to communicate and would somewhat shorten the transition to the long-run level of reserves. The staff noted that reducing the pace of redemptions before September would leave reserves and the balance sheet slightly larger than continuing redemptions at the current pace through September. However, the longer-run level of reserves and size of the balance sheet would ultimately be determined by long-term demand for Federal Reserve liabilities. Staff projections of term premiums and macroeconomic outcomes did not differ substantially across the two options. The staff also described a possible interim plan for reinvesting principal payments received from agency deb and agency mortgage-backed securities (MBS) after balance sheet runoff ends and until the Committee decides on the longer-run composition of the System Open Market Account (SOMA) portfolio. Consistent with the Committee’s long-standing aim to hold primarily Treasury securities in the longer run, any principal payments on agency debt and agency MBS would generally be reinvested in Treasury securities in the secondary market.These reinvestments would be allocated across sectors of the Treasury market roughly in proportion to the maturity composition of Treasury securities outstanding. However, the plan would maintain the existing $20 billion per month cap on MBS redemptions; principal payments on agency debt and agency MBS above $20 billion per month would continue to be reinvested in agency MBS. This cap would limit the pace at which the Federal Reserve’s agency MBS holdings could decline if prepayments accelerated; the staff projected that the redemption cap on agency debt and agency MBS was unlikely to be reached after 2019.
nonreserve liabilities, until the Committee chose to resume growth of the balance sheet in order to maintain a level of reserves consistent with efficient and effective policy implementation. Participants judged that ending the runoff of securities holdings at the end of September would reduce uncertainty about the Federal Reserve’s plans for its securities holdings and would be consistent with the Committee’s decision at its January 2019 meeting to continue implementing monetary policy in a regime of ample reserves. Participants discussed advantages and disadvantages of slowing balance sheet runoff before the September stopping date. A slowing in the pace of redemptions would accord with the Committee’s general practice of adjusting its holdings of securities smoothly and predictably, which might reduce the risk that market volatility would arise in connection with the conclusion of the runoff of securities holdings. However, these advantages needed to be weighed against the additional complexity of a plan that would end balance sheet runoff in steps rather than all at once. Participants reiterated their support for the FOMC’s intention to return to holding primarily Treasury securities in the long run. Participants judged that adopting an interim approach for reinvesting agency debt and agency MBS principal payments into Treasury securities across a range of maturities was appropriate while the Committee continued to evaluate potential long-run maturity structures for the Federal Reserve’s portfolio of Treasury securities. Many participants offered preliminary views on advantages and disadvantages of alternative compositions for the SOMA portfolio. Participants expected to further discuss the longer-run composition of the portfolio at upcoming meetings. Participants commented on considerations related to allowing the average level of reserves to decline in line with trend growth in nonreserve liabilities for a time after the end of balance sheet runoff. Several participants preferred to stabilize the average level of reserves by resuming purchases of Treasury securities relatively soon after the end of runoff, because they saw little benefit to further declines in reserve balances or because they thought the Committee should minimize the risk of interest rate volatility that could occur if the supply of reserves dropped below a point consistent with efficient and effective implementation of policy. Some others preferred to allow the average level of reserves to continue to decline for a longer time after balance sheet runoff ends because such declines could allow the Committee to learn more about underlying reserve demand, because they judged that such a process was not likely to result in excessive volatility in money market rates, or because they judged that moving to lower levels of reserves was more consistent with the Committee’s previous communications indicating that it would hold no more securities than necessary for implementing monetary policy efficiently and effectively. Participants noted that the eventual resumption of purchases of securities to keep pace with growth in demand for the Federal Reserve’s liabilities, whenever it occurred, would be a normal part of operations to maintain the ample-reserves monetary policy implementation regime and would not represent a change in the stance of monetary policy. Some participants suggested that, at future meetings, the Committee should discuss the potential benefits and costs of tools that might reduce reserve demand or support interest rate control. The manager of the SOMA discussed developments in global financial markets over the intermeeting period. In the United States, equity indexes moved higher and credit spreads tightened. Market participants attributed these moves largely to a perceived shift in the FOMC’s approach to policy following communications stressing that the Committee would be patient in assessing the need for future adjustments in the target range for the federal funds rate and would be flexible on balance sheet policy. In Europe, measures announced by the European Central Bank (ECB) in March, including an extension of forward guidance on interest rates and the announcement of another round of targeted long-term refinancing operations, were followed by a decline in euro-area equity markets, particularly bank stocks, as well as declines in euro-area rates. Market contacts attributed the price reaction to a perception that the measures were not as stimulative as might have been expected, given downward revisions in the ECB’s growth and inflation forecasts. In China, authorities moved toward an easier fiscal and monetary stance; China’s aggregate credit growth had rebounded slightly in recent months relative to the declining trend observed last year. The Shanghai Composite index had risen notably since the turn of the year, driven in part by fiscal and monetary stimulus measures as well as perceived progress on trade negotiations. Developments around Brexit remained a source of market uncertainty. Consistent with ongoing investor uncertainty over the outcome, risk reversals on the pound/dollar currency pair continued to point to higher demand for protection against pound depreciation relative to the dollar. a new low of around $1.4 trillion by early May, with some notable fluctuations in reserves on days associated with tax flows. The deputy manager also discussed the transition to a long-run regime of ample reserves, following the Committee’s January announcement that it intends to continue to implement monetary policy in such a regime. Once the size of the Federal Reserve’s balance sheet has normalized, the Open Market Desk will at some point need to conduct open market operations to maintain a level of reserves in the banking system that the Committee deems appropriate. In doing so, the Desk will need to assess banks’ demand for reserves as well as forecast other Federal Reserve liabilities and plan operations to maintain a supply of reserves sufficient to ensure that control over short-term interest rates is exercised primarily through the setting of administered rates. nonreserve liabilities. Following the manager and deputy manager’s report, some participants commented on various aspects of the minimum operating level approach. Decisions regarding how far to allow reserves to decline would need to balance important tradeoffs. On the one hand, a lower minimum operating level might increase the risk of excessive interest rate volatility. On the other hand, a lower minimum operating level could provide more opportunities to learn about underlying reserve demand or could be viewed as more consistent with moving to the smallest securities holdings necessary for efficient and effective monetary policy implementation. However, the scope for reducing the level of reserves much further after the end of balance sheet runoff might be fairly limited. By unanimous vote, the Committee ratified the Desk’s domestic transactions over the intermeeting period.There were no intervention operations in foreign currencies for the System’s account during the intermeeting period. change in the price index for personal consumption expenditures (PCE), was somewhat below 2 percent in December, held down in part by recent declines in consumer energy prices, while PCE price inflation for items other than food and energy was close to 2 percent; more recent readings on PCE price inflation were delayed by the earlier federal government shutdown. Survey-based measures of longer-run inflation expectations were little changed on balance. Increases in total nonfarm payroll employment remained solid, on average, in recent months; employment rose only a little in February but had expanded strongly in January. The national unemployment rate edged down, on net, over the past two months to 3.8 percent in February, and both the labor force participation rate and the employment-to-population ratio rose slightly on balance. The unemployment rates for African Americans, Asians, and Hispanics in February were at or below their levels at the end of the previous economic expansion, though persistent differentials in unemployment rates across groups remained. The share of workers employed part time for economic reasons moved down in February and was below the lows reached in late 2007.
four-week moving average of initial claims for unemployment insurance benefits through early March was still near historically low levels. Average hourly earnings for all employees rose 3.4 percent over the 12 months ending in February, a significantly faster pace than a year earlier. The employment cost index for private-sector workers increased 3 percent over the 12 months ending in December, somewhat faster than a year earlier. Total labor compensation per hour in the business sector increased 2.9 percent over the four quarters of 2018, about the same rate as a year earlier. spending to a solid pace in the near term. In addition, consumer sentiment, as measured by the University of Michigan Surveys of Consumers, stepped up in February and early March to an upbeat level. Real residential investment appeared to be softening further in the first quarter, likely reflecting, in part, decreases in the affordability of housing arising from both the net increase in mortgage interest rates over the past year and ongoing house price appreciation. Starts of new single-family homes increased slightly, on net, over December and January, while starts of multifamily units declined. Building permit issuance for new single-family homes—which tends to be a good indicator of the underlying trend in construction of such homes—moved down over those two months. In addition, sales of both new and existing homes decreased in January. roughly offset by an expected decline in real nondefense purchases stemming from the effects of the partial federal government shutdown. Real purchases by state and local governments looked to be rising modestly in the first quarter, as the payrolls of those governments expanded a bit in January and February, and nominal state and local construction spending rose, on net, in December and January. The nominal U.S. international trade deficit narrowed in November before widening in December to the largest deficit since 2008. Exports declined in November and December, as exports of industrial supplies and automotive products fell in both months. Imports decreased in November before partially recovering in December, with imports of consumer goods and industrial supplies driving this swing. The BEA estimated that the change in net exports was a drag of about ¼ percentage point on the rate of real GDP growth in the fourth quarter. Total U.S. consumer prices, as measured by the PCE price index, increased 1.7 percent over the 12 months ending in December, slightly slower than a year earlier, as consumer energy prices declined a little and consumer food prices rose only modestly. Core PCE price inflation, which excludes changes in consumer food and energy prices, was 1.9 percent over that same period, somewhat higher than a year earlier. The consumer price index (CPI) rose 1.5 percent over the 12 months ending in February, while core CPI inflation was 2.1 percent. Recent readings on survey-based measures of longer-run inflation expectations—including those from the Michigan survey, the Blue Chip Economic Indicators, and the Desk’s Survey of Primary Dealers and Survey of Market Participants—were little changed on balance. economies (EMEs), including Brazil and Mexico, along with continued economic weakness in the euro area and China. In the advanced foreign economies (AFEs), recent data suggested that economic activity, especially in the manufacturing sector, remained subdued in the first quarter of this year. Economic activity also remained weak in many EMEs, particularly in Mexico and emerging Asia excluding China, although some data pointed to a modest pickup in China. Inflation in foreign economies slowed further early this year, partly reflecting lower retail energy prices across both AFEs and EMEs. FOMC communications issued following the January meeting were generally viewed by market participants as more accommodative than expected. Subsequent communications—including the minutes of the January FOMC meeting, the Chair’s semiannual testimony to the Congress, and speeches by FOMC participants—were interpreted as reflecting a patient approach to monetary policy in the near term and a likely conclusion to the Federal Reserve’s balance sheet reduction by the end of this year. The market-implied path for the federal funds rate in 2019 declined slightly over the period, while investors continued to expect no change to the target range for the federal funds rate at the March FOMC meeting. The market-implied path of the federal funds rate for 2020 and 2021 shifted down a little. Yields on nominal Treasury securities declined a bit across the Treasury yield curve over the intermeeting period. Communications from FOMC participants that were more accommodative than expected amid muted readings on inflation, communications from other major central banks that, on balance, were also regarded as more accommodative than expected, and generally mixed economic data releases reportedly contributed to the decrease in yields and outweighed improved risk sentiment. The spread between the yields on nominal 10- and 2-year Treasury securities was little changed over the period and remained in the lower end of its historical range of recent decades. Measures of inflation compensation derived from Treasury Inflation-Protected Securities increased modestly, on net, although they remained below levels seen last fall. the fourth quarter of 2018 and earnings projections for 2019. Consistent with reports about a potential trade deal, stock prices of firms with greater exposure to China generally outperformed the S&P 500 index. Optionimplied volatility on the S&P 500 index at the onemonth horizon—the VIX—declined and reached its lowest point this year. Spreads on investment- and speculative-grade corporate bonds narrowed, consistent with the gains in equity prices, but were still wider than levels observed last fall. reserves, while take-up in the overnight reverse repurchase agreement facility remained low. Yield spreads on commercial paper and negotiable certificates of deposit generally narrowed further from their elevated year-end levels, likely reflecting an increase in investor demand for short-term financial assets. Meanwhile, the statutory federal government debt ceiling was reestablished at $22 trillion on March 1.
growth. In particular, global equity prices generally ended the period higher, and dedicated emerging market funds continued to see inflows. At the same time, longterm AFE yields declined somewhat, on net, on communications from major foreign central banks and investors’ concerns about foreign economic growth. The broad dollar index appreciated slightly as the extension of accommodative policies and revised guidance by major foreign central banks weighed on AFE currencies. ticked up in February, consistent with the uptick in the stock market. In the commercial real estate (CRE) sector, financing conditions continued to be generally accommodative. Commercial mortgage-backed securities (CMBS) spreads declined over the intermeeting period, with triple-B spreads moving down to near their lateNovember levels. Issuance of non-agency CMBS remained strong through February, and CRE lending by banks grew at a strong pace in February following relatively sluggish growth in January. Financing conditions in consumer credit markets were little changed in recent months and remained generally supportive of household spending. Credit card loan growth remained strong through December, though the pace slowed during 2018 amid tighter lending standards by commercial banks. Auto loan growth remained steady through the end of 2018.
negative effects on U.S. economic growth. Risks to the inflation projection also were seen as balanced. The upside risk that inflation could increase more than expected in an economy that is still projected to be operating notably above potential for an extended period was counterbalanced by the downside risk that longer-term inflation expectations may be lower than was assumed in the staff forecast, as well as the possibility that the dollar could appreciate if foreign economic conditions deteriorated. shocks to the economy. These projections and policy assessments are described in the Summary of Economic Projections (SEP), which is an addendum to these minutes. Participants agreed that information received since the January meeting indicated that the labor market had remained strong but that growth of economic activity had slowed from its solid rate in the fourth quarter. Payroll employment was little changed in February, but job gains had been solid, on average, in recent months, and the unemployment rate had remained low. Recent indicators pointed to slower growth of household spending and business fixed investment in the first quarter. On a 12-month basis, overall inflation had declined, largely as a result of lower energy prices; inflation for items other than food and energy remained near 2 percent. On balance, market-based measures of inflation compensation had remained low in recent months, and survey-based measures of longer-term inflation expectations were little changed. noted that softness in consumer spending had contributed importantly to the projected slowing in economic growth in the current quarter. Many participants pointed to the weakness in retail sales in December as notable, although they recognized that the data for January had shown a partial recovery in retail sales. Participants also observed that much of the recent softness likely reflected temporary factors, such as the partial federal government shutdown and December’s volatility in financial markets, and that consumer sentiment had recovered after these factors had receded. Consequently, many participants expected consumer spending to proceed at a stronger pace in coming months, supported by favorable underlying factors, including a strong labor market, solid growth in household incomes, improvements in financial conditions and in households’ balance sheet positions, and upbeat consumer sentiment. Participants noted, however, that the continued softness in the housing sector was a concern. Participants noted that the latest readings on overall inflation had been somewhat softer than expected. However, participants observed that these readings largely reflected the effects of earlier declines in crude oil prices and that core inflation remained near 2 percent. Most participants, while seeing inflation pressures as muted,expected the overall rate of inflation to firm somewhat and to be at or near the Committee’s longer-run objective of 2 percent over the next few years. Many participants indicated that, while inflation had been close to 2 percent last year, it was noteworthy that it had not shown greater signs of firming in response to strong labor market conditions and rising nominal wage growth, as well as to the short-term upward pressure on prices arising from tariff increases. Low rates of price increases in sectors of the economy that were not cyclically sensitive were cited by a couple of participants as one reason for the recent easing in inflation. A few participants observed that the pickup in productivity growth last year was a welcome development helping to bolster potential output and damp inflationary pressures. In their discussion of indicators of inflation expectations, participants noted that market-based measures of inflation compensation had risen modestly over the intermeeting period, although they remained low. A couple of participants stressed that recent readings on survey measures of inflation expectations were also still at low levels. Several participants suggested that longerterm inflation expectations could be at levels somewhat below those consistent with the Committee’s 2 percent inflation objective and that this might make it more difficult to achieve that objective on a sustained basis. labor force participation rate, a low number of layoffs, near-record levels of job openings and help-wanted postings, and solid job gains, on average, in recent months. Participants observed that, following strong job gains in January, there had been little growth in payrolls in February, although a few participants pointed out that the February reading had likely been affected by adverse weather conditions. A couple of participants noted that, over the medium term, some easing in payroll growth was to be expected as economic growth slowed to its longer-run trend rate. Reports from business contacts predominantly pointed to continued strong labor demand, with firms offering both higher wages and more nonwage benefits to attract workers. Economy-wide wage growth was seen as being broadly consistent with recent rates of labor productivity growth and with inflation of 2 percent. A few participants cited the combination of muted inflation pressures and expanding employment as a possible indication that some slack remained in the labor market. of adverse outcomes were somewhat lower than in January. Other downside risks included the possibility of sizable spillovers from a greater-than-expected economic slowdown in Europe and China, persistence ofthe softness in spending, or a sharp falloff in fiscal stimulus. A few participants observed that an economic deterioration in the United States, if it occurred, might be amplified by significant debt service burdens for many firms. Participants also mentioned a number of upside risks regarding the outlook for economic activity, including outcomes in which various sources of uncertainty were resolved favorably, consumer and business sentiment rebounded sharply, or the recent strengthening in labor productivity growth signaled a pickup in the underlying trend. Upside risks to the outlook for inflation included the possibility that wage pressures could rise unexpectedly and lead to greater-than-expected price increases. less reliable basis for assessing the implications of the recent behavior of the yield curve. Several participants pointed to the increased debt issuance and higher leverage of nonfinancial corporations as a development that warranted continued monitoring. In their discussion of monetary policy decisions at the current meeting, participants agreed that it would be appropriate to maintain the current target range for the federal funds rate at 2¼ to 2½ percent. Participants judged that the labor market remained strong, but that information received over the intermeeting period, including recent readings on household spending and business fixed investment, pointed to slower economic growth in the early part of this year than in the fourth quarter of 2018. Despite these indications of softer firstquarter growth, participants generally expected economic activity to continue to expand, labor markets to remain strong, and inflation to remain near 2 percent. Participants also noted significant uncertainties surrounding their economic outlooks, including those related to global economic and financial developments. In light of these uncertainties as well as continued evidence of muted inflation pressures, participants generally agreed that a patient approach to determining future adjustments to the target range for the federal funds rate remained appropriate. Several participants observed that the characterization of the Committee’s approach to monetary policy as “patient” would need to be reviewed regularly as the economic outlook and uncertainties surrounding the outlook evolve. A couple of participants noted that the “patient” characterization should not be seen as limiting the Committee’s options for making policy adjustments when they are deemed appropriate. as part of the policy process. Participants also discussed alternative interpretations of subdued inflation pressures in current economic circumstances and the associated policy implications. Several participants observed that limited inflationary pressures during a period of historically low unemployment could be a sign that low inflation expectations were exerting downward pressure on inflation relative to the Committee’s 2 percent inflation target; in addition, subdued inflation pressures could indicate a less tight labor market than suggested by common measures of resource utilization. Consistent with these observations, several participants noted that various indicators of inflation expectations had remained at the lower end of their historical range, and a few participants commented that they had recently revised down their estimates of the longer-run unemployment rate consistent with 2 percent inflation. In light of these considerations, some participants noted that the appropriate response of the federal funds rate to signs of labor market tightening could be modest provided that signs of inflation pressures continued to be limited. Some participants regarded their judgments that the federal funds rate was likely to remain on a very flat trajectory as reflecting other factors, such as low estimates of the longer-run neutral real interest rate or riskmanagement considerations. A few participants observed that the appropriate path for policy, insofar as it implied lower interest rates for longer periods of time,could lead to greater financial stability risks. However, a couple of these participants noted that such financial stability risks could be addressed through appropriate use of countercyclical macroprudential policy tools or other supervisory or regulatory tools. In their discussion of monetary policy for the period ahead, members judged that the information received since the Committee met in January indicated that the labor market remained strong but that growth of economic activity had slowed from its solid rate in the Q4. Payroll employment was little changed in February,but job gains had been solid, on average, in recent months, and the unemployment rate had remained low. Recent indicators pointed to slower growth of household spending and business fixed investment in the first quarter. On a 12-month basis, overall inflation had declined, largely as a result of lower energy prices; inflation for items other than food and energy remained near 2 percent. On balance, market-based measures of inflation compensation had remained low in recent months, and survey-based measures of longer-term inflations expectations were little changed. In their consideration of the economic outlook, members noted that financial conditions had improved since the beginning of year, but that some time would be needed to assess whether indications of weak economic growth in the first quarter would persist in subsequent quarters. labor market conditions, and inflation near the Committee’s symmetric 2 percent objective as the most likely outcomes for the U.S. economy in the period ahead. adjustments to the target range for the federal funds rate may be appropriate to support those outcomes. After assessing current conditions and the outlook for economic activity, the labor market, and inflation, members decided to maintain the target range for the federal funds rate at 2¼ to 2½ percent. the Committee would assess realized and expected economic conditions relative to the Committee’s maximum employment and symmetric 2 percent inflation objectives. They reiterated that this assessment would take into account a wide range of information, including measures of labor market conditions, indicators of inflation pressures and inflation expectations, and readings on financial and international developments. More generally, members noted that decisions regarding nearterm adjustments of the stance of monetary policy would appropriately remain dependent on the evolution of the outlook as informed by incoming data. that are available for such operations and by a per-counterparty limit of $30 billion per day. The vote also encompassed approval of the statement below to be released at 2:00 p.m.: “Information received since the Federal Open Market Committee met in January indicates that the labor market remains strong but that growth of economic activity has slowed from its solid rate in the fourth quarter. Payroll employment was little changed in February, but job gains have been solid, on average, in recent months, and the unemployment rate has remained low. Recent indicators point to slower growth of household spending and business fixed investment in the first quarter. On a 12-month basis, overall inflation has declined, largely as a result of lower energy prices; inflation for items other than food and energy remains near 2 percent. On balance, market-based measures of inflation compensation have remained low in recent months, and survey-based measures of longerterm inflation expectations are little changed. Consistent with its statutory mandate, the Committee seeks to foster maximum employment and price stability. In support of these goals, the Committee decided to maintain the target range for the federal funds rate at 2¼ to 2½ percent. The Committee continues to view sustained expansion of economic activity, strong labor market conditions, and inflation near the Committee’s symmetric 2 percent objective as the most likely outcomes. In light of global economic and financial developments and muted inflation pressures, the Committee will be patient as it determines what future adjustments to the target range for the federal funds rate may be appropriate to support these outcomes. Consistent with the Committee’s decision to leave the target range for the federal funds rate unchanged, the Board of Governors voted unanimously to leave the interest rates on required and excess reserve balances unchanged at 2.40 percent and voted unanimously to approve establishment of the primary credit rate at the existing level of 3.00 percent, effective March 21, 2019. It was agreed that the next meeting of the Committee would be held on Tuesday–Wednesday, April 30–May 1, 2019.